Uncharted: Golden Abyss features a young Nathan Drake on an adventure with Dante, a high speaking Italian American who tags along with Drake not for the adventure, but for the money. Dante needs help identifying some old Central American relics, these relics eventually put Drake on the path of Spanish treasure hunters. Drake eventually catches the eye of Marisa Chase who decides to join forces with our protagonist. Marisa and Drake eventually cross paths with a Fidel Castro lookalike who is up to no good. In terms of story this game is lacking the quality that the previous Uncharted games held so dearly. Cutscenes can be mind numbing and story can be quite difficult to follow. 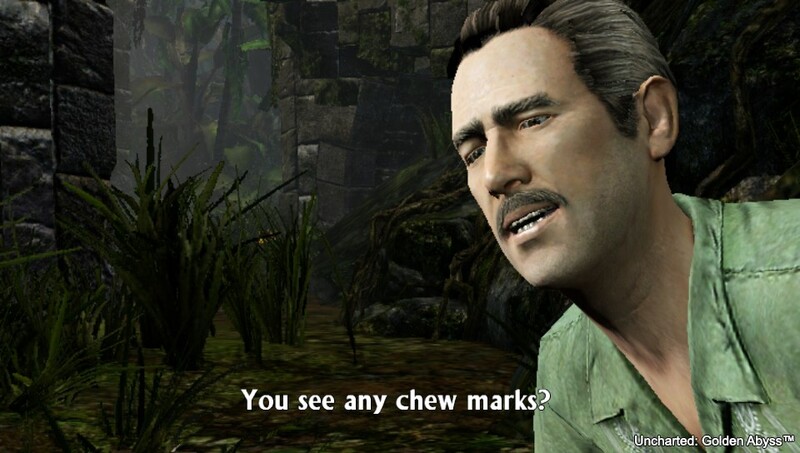 Dialogue is still pitch perfect, writing is solid and motion capture acting is as good as ever due to Nolan North reprising his role as Nathan Drake. Uncharted: Golden Abyss's core mechanics truly make the game what it is. levels consist of puzzle solving, climbing and the good old "shoot 'em up battles" level quality is consistent and truly spectacular mainly because of the variety, sometimes you will be endlessly killing mercenaries and sometimes you will be shimmying of a precarious rock to dodge crossfire. Puzzles are entertaining and stressful at the same time. 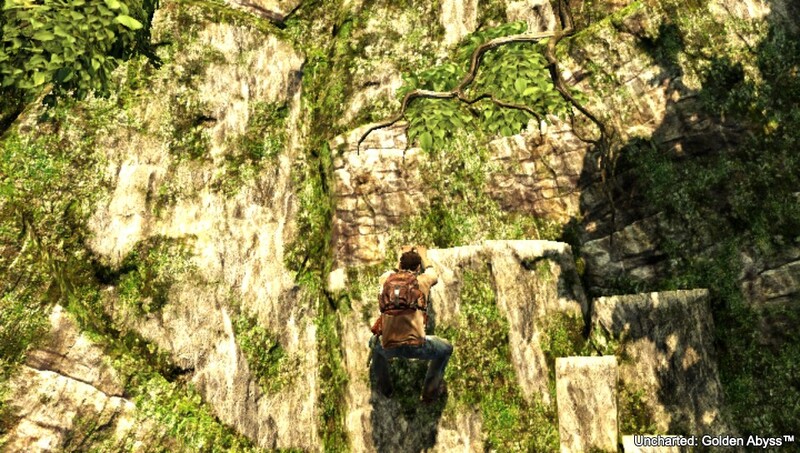 It feels like Sony Bend bombards you with puzzles just to keep the whole Uncharted touch. 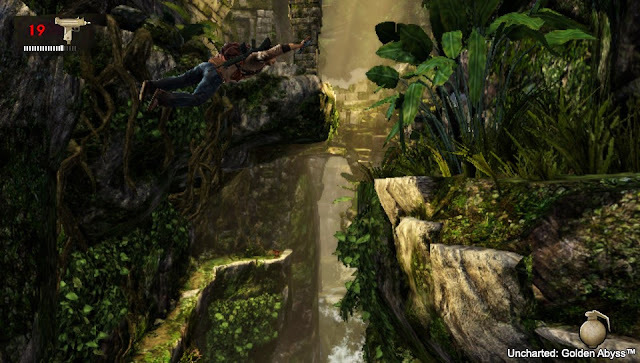 Though it has some issues in terms of gameplay Uncharted: Golden Abyss does not disappoint. 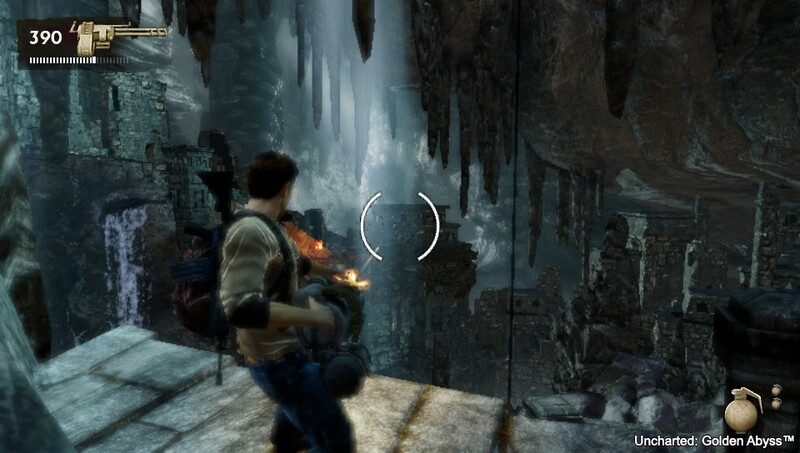 The visuals in Uncharted: Golden Abyss are phenomenal, jungle scenes contain some of the best lighting available on a portable platform. Texture quality is immense, general shrubbery and environmental detail is clean and crisp. 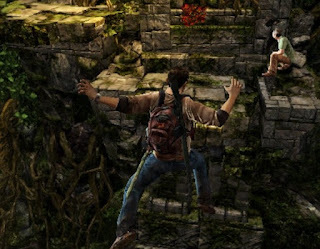 However Uncharted: Golden Abyss's biggest drawback has to be its lack of variety in terms of environments. 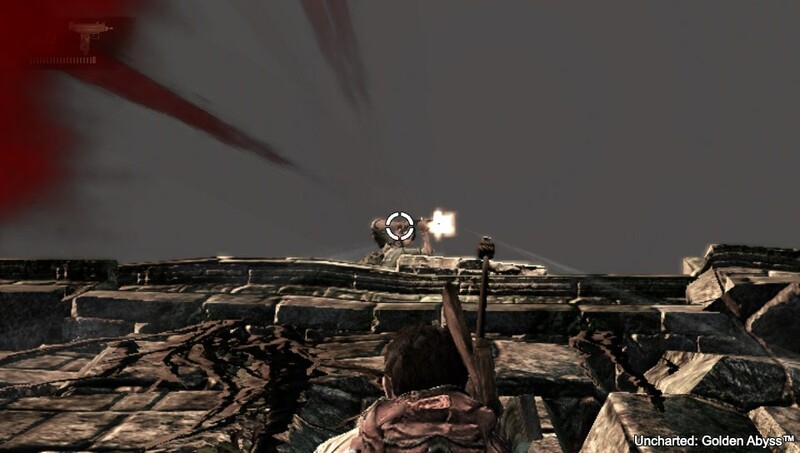 in Uncharted 3 you battled the desert, cities and airports. 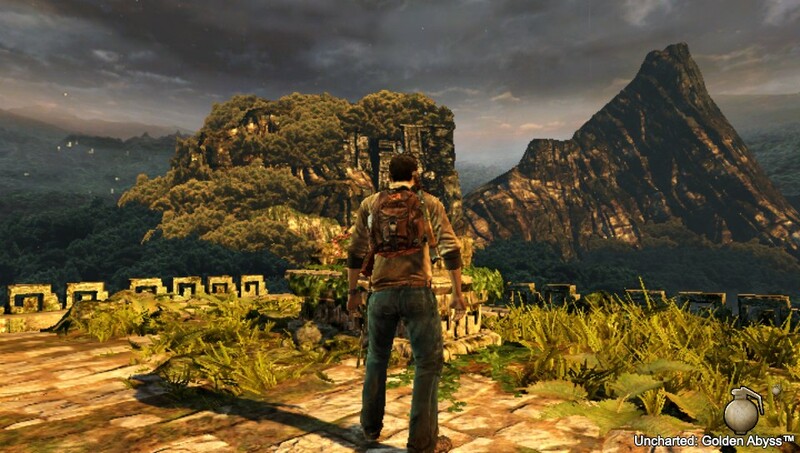 Uncharted: Golden Abyss seems to take place in 2 environments: a beautifully designed jungle and a damp rock formation, the lack of environments prevent Uncharted: Golden Abyss from surpassing its console predecessors. Character models are not quite as detailed as consoles but they do surpass most portable games. Another visual issue is the desperate lack of anti-aliasing. Drakes character model can sometimes look much to "jaggy"
Controling Drake is simplistic and natural. Drake can climb using the thumbsticks or the touchscreen by dragging your finger along a path, this is a nice touch but if its not broke don't fix it. aiming and shooting are also quintessential the whole process is natural and immersive. One of the best control features come from Sony Bend's use of the gyro-meter to slightly move Drakes reticule. This feature makes the game a whole lot easier to play. Golden Abyss features a standard amount of content. There is nothing other than a tantalising campaign mode with around 12 hours of playtime. And multiple difficulty modes, the campaign can be played more than once as there is a vast vast amount of collectibles. Drakes journal holds access to more than enough treasure maps and extras to find. Uncharted: Golden Abyss does what its supposed to, bring the critically acclaimed Uncharted series to the silver screen and Sony Bend manages to do that superbly, though it has some hiccups visuals are staggering, gameplay is exceptional, though the story is sub par when compared to other Uncharted entries. 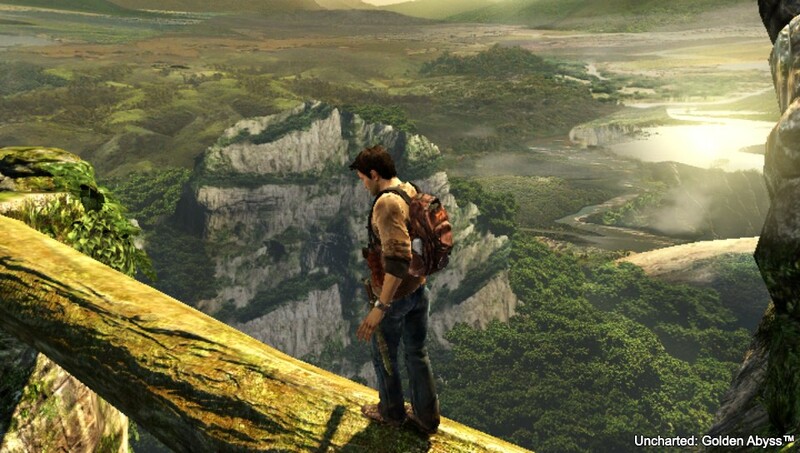 Uncharted: Golden Abyss remains one of the greatest handheld adventure games to grace the PS Vita.